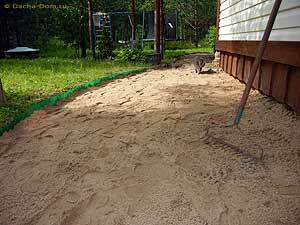 Decomposed granite, or granite sand, is a dense packable material that is long-wearing and resistant to erosion and settling. 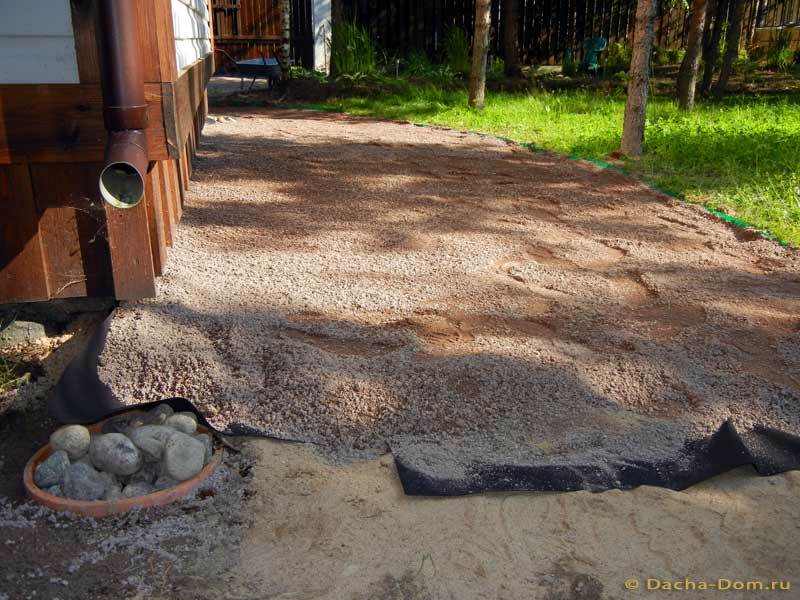 Garden pathways made from granite sand are attractive and durable pavements. 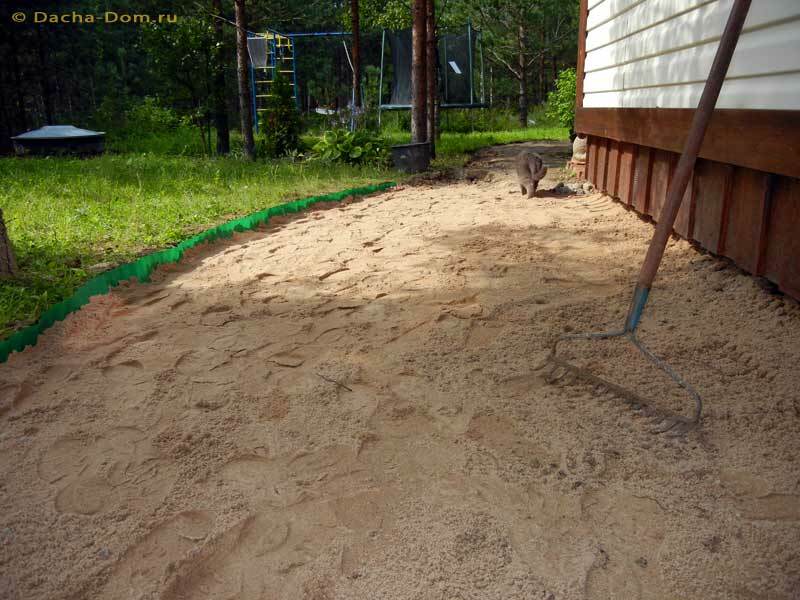 Granite sand pathway is a good choice for small garden for simplicity and ease of construction. 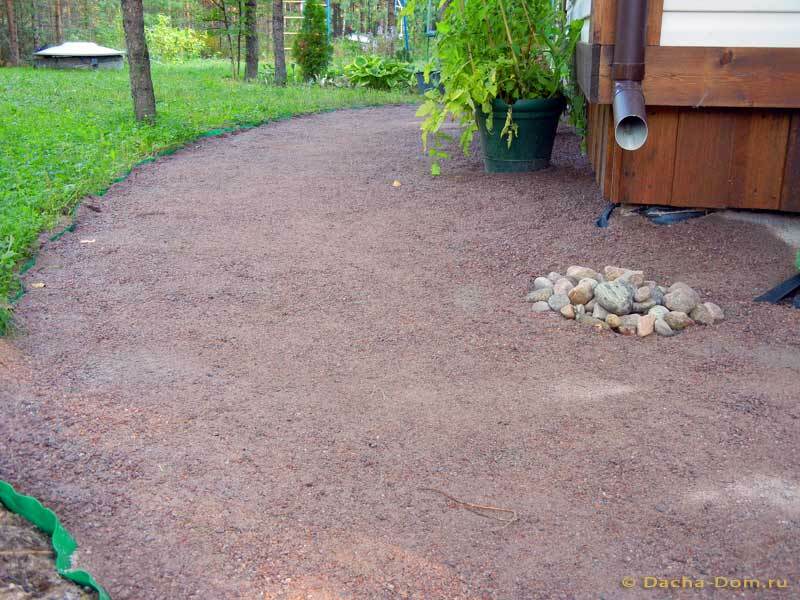 Decomposed granite gives you a natural look that you can use to enhance your natural landscape. It drains well, is easily compacted, creates a natural appearance and is available in different sizes. It is ideal for use as a material for functional walkways and paths around the home. The sand garden pathways are designed for foot traffic and other light use only. Because the path is set only on sand, it won't stay as flat and smooth as a traditional paver walk set on a compacted gravel bed. 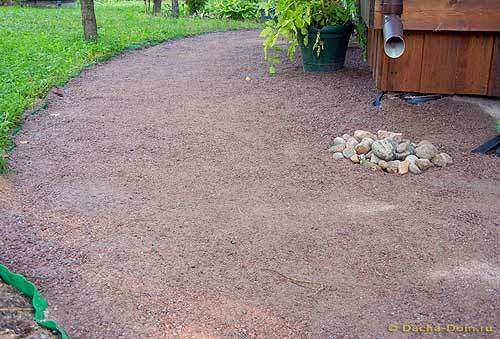 Use crushed rock bed for the decomposed granite driveways. Decomposed granite needs a solid bed to lie on. 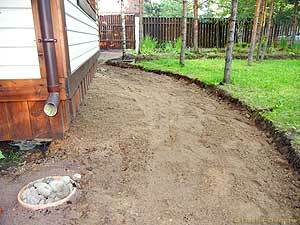 Dig out the soil to a depth of 1-1,5 shovel blade depth from the area where you'll be putting in the walkway (pathway). Keep the small slope against the house to let the water run away from it over the pathway. 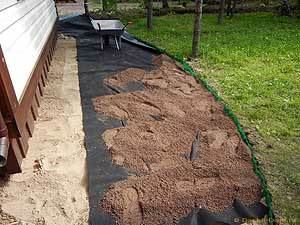 Add soil around the house to improve drainage. Then cut the garden pathway edges vertically along the painted line on one side. Shave the bottom flat. Decomposed granite areas still benefit from edging such as polymer edging, steel edge, or landscaping timbers to slow or prevent erosion. Install edging to prevent the decomposed granite from filtering into the yard. 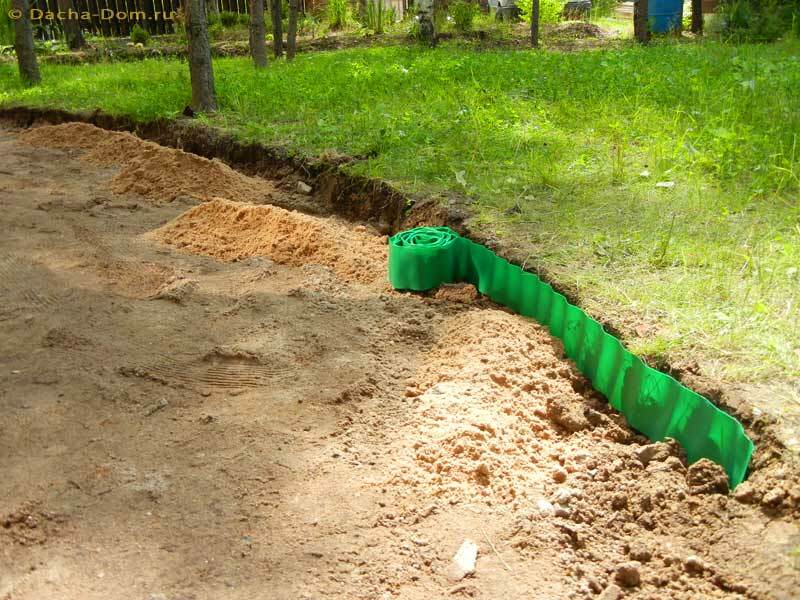 Install edging along the sides with metal or plastic edging strips, a hammer and nail spikes to contain loose material and stop weed encroachment. For a more formal look, use pavers or natural stones as edge restraints. Set landscape edging along the garden pathway vertical cut edge. 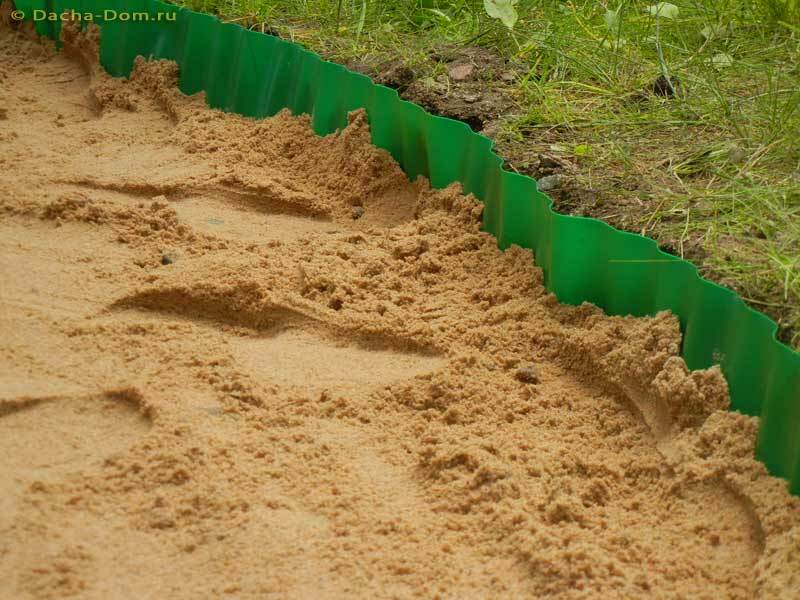 Fix edging with the sand or ground spikes. The top of the plastic landscape edging will be the finished height of garden pathway. Set it with 1 cm higher than the surrounding lawn or garden so water will drain off the path. 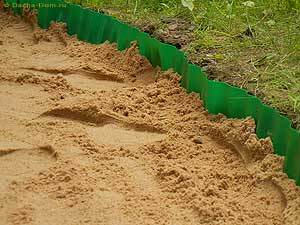 Fill the excavation with damp sand to a level about 10 cm below the top of the lanscape edging. Smooth the sand with a rake. Make several passes to ensure that the surface is smooth. Compact the sand firmly with a hand tamper. Although a motorized plate compactor works best, a hand tamper works fine for a small, informal path like this. The sand should be slightly damp when you tamp it to help it pack. Sprinkle it with water if it's dry. Place a layer of landscape cloth on the bottom of the excavated area. Overlap separate pieces of cloth by 20-30 cm. 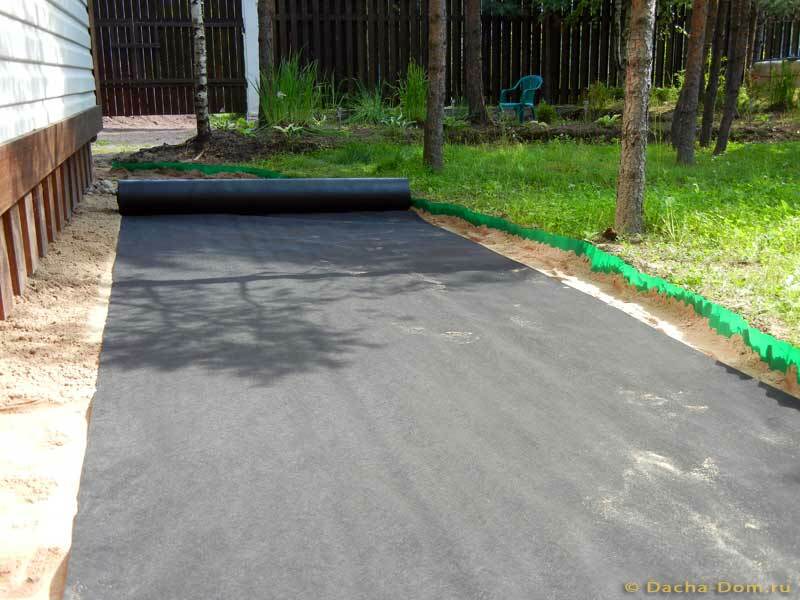 The landscape cloth will inhibit the growth of weeds through the bottom of the walkway and will keep grainte sand in compact shape. Decomposed granite selection ranges from 8 mm pieces to pieces no bigger than grains of sand. The larger pieces can provide more surface texture to garden pathway. The smaller pieces provide a smooth surface. The small granite chips of decomposed granite come in different color ranges. In St. Petersburg red, pink and grey decomposed granite shades are available. Pour decomposed granite into the garden pathway and rake smooth to the top of the borders. The total granite pavement thickness should be at least 10 cm. Place a board on top of the granite and walk on it to tamp the granite down. Repeat along the course of the walkway. Add more granite if necessary to re-level and smooth the pathway. 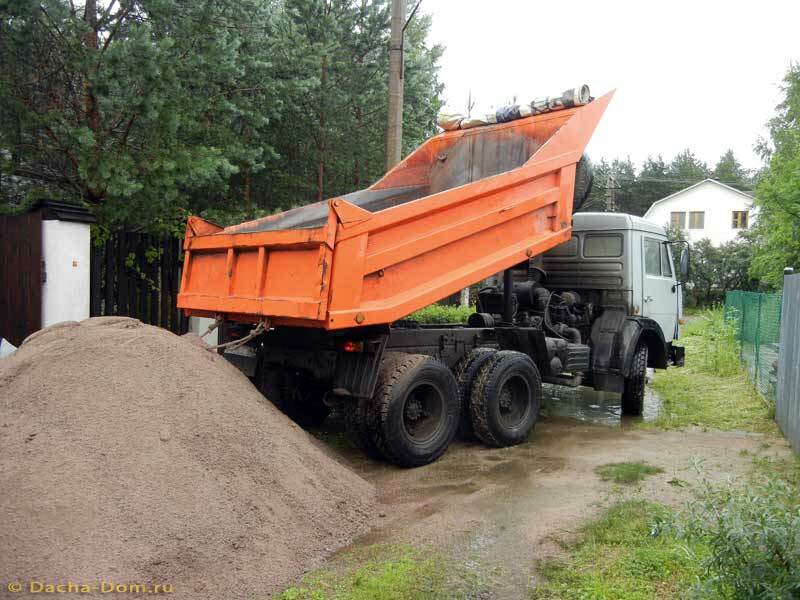 Spend time compacting the granite sand patheway surface thoroughly. The surface should be firm enough that you don't leave footprints on it. The more firmly compacted the surface is, the longer the decomposed granite garden pathway will last in shape. 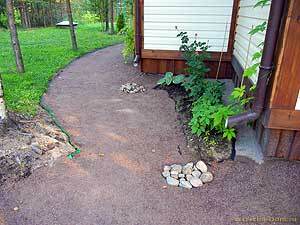 Use stones and drain well to protect granite pathways under a gutter drain. Otherwise the torrential water will wash out the granite sand every time it rains.